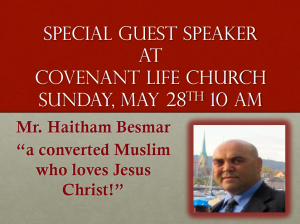 Brother Haitham Besmar has a passion for telling others about Jesus, especially Muslims, having grown up a Muslim from birth. The first time I personally met him, he told me a story about leading an elderly worker in a supermarket to the Lord Jesus Christ. Brother Besmar has something to say that we at Covenant Life need to hear. He will be speaking in the Sunday morning worship service, this Sunday, May 28th, 10 AM, at Covenant Life Church of God. Your are invited and encouraged to attend to hear his testimony and catch his passion for souls! Brother Besmar was a successful international economist for over 20 years in countries such as the Czech Republic, Russia, the Middle East, Far East, Africa and Europe. I was saved on my death bed by our Lord Jesus Christ and 2 days later I left the hospital on my own feet. Since then I have been dedicated to serve Him without compromise. I have been travelling around the USA to teach our Christian brothers and sisters in Christ on how to understand Islam and evangelize to Muslims without fear and how to shake the foundation of Islam to the core and without compromise but still reflecting the love of our Lord. I have taken part in many conferences and awareness classes through the Church of God in Florida including but not limited to the Church of God Growth conference and the annual Campmeeting and in other denominations around the USA. I have established the “All for God” Mission for Muslim outreach and have indeed started distributing my Book, From Deception to the Truth, from Allah to God, under the pen name, Sam Daniels, as a tool of exposing the deception of Islam and the trueness of Christ and His Deity. I am now serving the Lord full time and for His Glory.